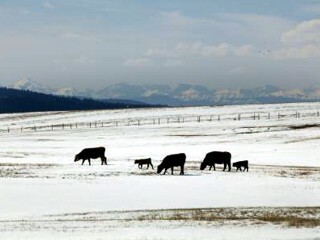 The fresh blanket of snow across the landscape near Picture Butte, Alta., could serve as a symbol of the new chapter and blank slate of possibility for agriculture as it looks ahead to 2014. It's from this geographical standpoint and 'fresh thinking' mindset that John Kolk takes stock of the bigger picture for agriculture and the new set of expectations taking shape for producers and their industries. Kolk has enjoyed a long career both as a producer and also as a representative and trusted advisor for the industry in a variety of roles, including with a strong focus on sustainability issues. An irrigation and dryland farmer, for many years he also operated a progressive cattle feedyard and poultry operation. Most recently, Kolk has been in the spotlight as a key player in The Straw Man Team – an innovative approach to support a stronger Canadian beef industry. What Kolk sees today on the animal care front is a new era with new demands that is closely tied to the trends apparent with other key issues such as environmental stewardship. "It's becoming one of many larger issues that get thrown in the basket of social license. We need to address it as thoroughly as we do these other issues. We need to be on top of it and be trusted to be on top of it, to be competitive in the marketplace of the future." The bar today is clearly higher, he says. "We're in that space where the perception that farmers have of how good of stewards they are and the perception that others have, or some would like to lodge in, for whatever reasons, are diverging. "It probably used to be good enough in some ways, to say 'I'm a farmer. I'm a good steward of the land, I care for my animals, I do a good job. That's who I am.' But we haven't gone out and proved it. And now we're being asked to do that." The vast majority of stakeholders are not looking to question or challenge agriculture, he says. But there is much higher scrutiny across the board, including a more focused and vocal element that is looking for weak spots. It's easy to complain about this challenge but the responsibility to address it lies with the industry, he says. "Whether it's certain housing systems, or antibiotic use, painful procedures or other practices that come under scrutiny, we need to have a good rationale for what we're doing and be open to innovation to find a better way to do it." Standing still is the same as going backward, he says. "Not just when the W5-type exposures happen, but all the time, when we find something that doesn't smell right to us or to someone who is not involved in our industry, we need to be more clear and deliberate in addressing it. We need to find a way to say this is what we stand for and this is what we're going to do." Agriculture has done some good things to improve how it communicates and builds trust, says Kolk. The Straw Man approach is one of several recent initiatives that stand as examples of more focus being put on addressing this need. But there is a lot of room to improve. "We have not done enough to go out in a way that attracts understanding by our customers. We have not explained ourselves in the way we should. Nor have we gone out of our way to prove that we do a reasonable job. We need to turn that around." The main issue is typically not whether or not farmers are actually doing a good job but rather what is the perception and where is agriculture vulnerable. No industry is perfect and livestock production shouldn't be defensive, he says. "There are going to be issues in any sector. It's how you deal with these issues and show your commitment to improve that is important." There are lessons for agriculture from other industries, he says. "I look back at the lumber industry, where 25 years ago it was seen as the worst of the worst. Now its reputation has gone up. They were unaware of the sensitivity that could be raised with the customer around old growth forests. They had some practices they had to clean up. No question. But they also had to tell their story and show they were operating responsibly in a way that was much more transparent and legitimate." The lumber industry also had to engage stakeholders that were not traditionally what they would consider stakeholders, he says, and agriculture can do that too. "I think the farm community is at the stage to say there are different expectations and demands we need to listen to. We need to think about our customers and our stakeholders in a way we've not traditionally thought about them. We may not always agree but we need to listen and be responsive if we want to sell to them. We need to talk about our business in a way that addresses their questions and strengthens that relationship."